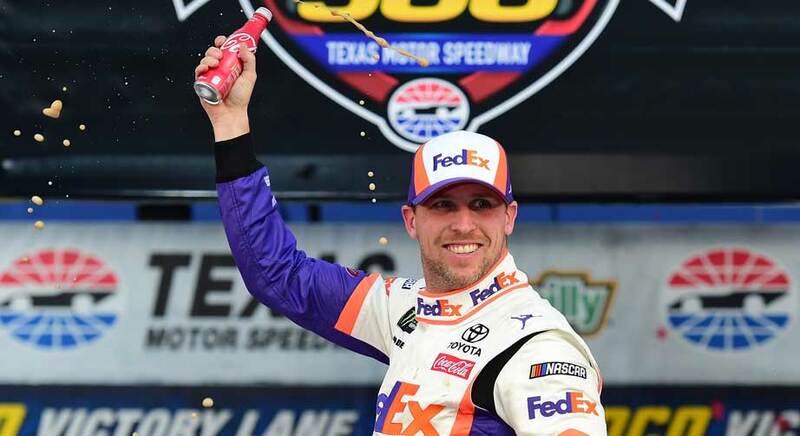 Denny Hamlin was the third driver, joining Kyle Busch and Brad Keselowski, to win a second NASCAR Cup Series Race when he took the O’Reilly Auto Parts 500 at Texas Motor Speedway on Sunday. Hamlin was a 25/1 pick to win. What was so surprising about Hamlin’s victory was that he did despite multiple penalties. He got knocked for speeding on Lap 64 and an uncontrolled tire on Lap 173. He also missed pit road under green during a pit cycle in Stage 1 and had a slow pit stop after a tire changer dropped a pit gun. The last time a driver overcame two penalties on pit road and won was Keselowski at Talladega in October 2014. The 38-year-old credited his Toyota and the Joe Gibbs Racing team for his 33rd career victory. Kevin Harvick’s 2019 slump continued, as he finished eighth at Texas Motor Speedway. He has yet to win a race this year. By this time last year Harvick had three victories, sweeping the West Coast races in Las Vegas, Phoenix, and Fontana. This year he has six top-10 finishes, but has not led a lap since Las Vegas. Jimmie Johnson’s resurgence in 2019 continues, despite not yet winning a Series Cup event. He did win the unofficial Clash at Daytona in January. The 43-year-old did not win last year, and is trying to break his winless streak. A strong sign was his performance at Texas Motor Speedway. The eight-time Cup champion lead 60 laps of the race. That is 24 more than he had all of last year. Johnson also posted his third 10 ten. At this point last year, he only had one, a ninth-place finish at Fontana. Drafting during qualifying continues to be a concern, and NASCAR chief racing development officer Steve O’Donnell said on SiriusXM NASCAR channel that every option is being considered, including single-car qualifying. Talladega uses single-car qualifying and the next track that could see it is Kansas Speedway for the Kansas 400 on May 11. The drivers are at Bristol Motor Speedway for the Food City 500. The favorite is Kyle Busch at 5/2, but we like Johnson at 25/1. He has won this race twice, most recently in 2017, and he’s finished inside the top-10 in seven of his last nine appearances.